Apart from his prolific musical output, we actually know very little about the person, Frank Rabeyrolle, a PHD in Philosophy, with an endless love for strange analogue drum machines. Discovered in 2005 with ‘Life Behind A Window‘ under the Double U alias, Frank had great press acclaim in his native France. With his dreamy songwriting, Frank is a veteran in the indie electronic scene of France. International press caught on too and equally fell for his Gallic charm (De Bug, Xlr8r, Lodown). In fact, since his first album, Frank Rabeyrolles has been frenetically productive, releasing a new record every year, initially as Double U and then under the name of Franklin, all through his own label, Wool Recordings. Following his constant desire of mutation, Frank Rabeyrolles now decided to turn his alias Franklin into a duo. The collaboration with Parisian producer Lockhart shakes up his hybrid-dreamy music. Playing with codes of pop and electronic music, he brings a different definition to song writing. 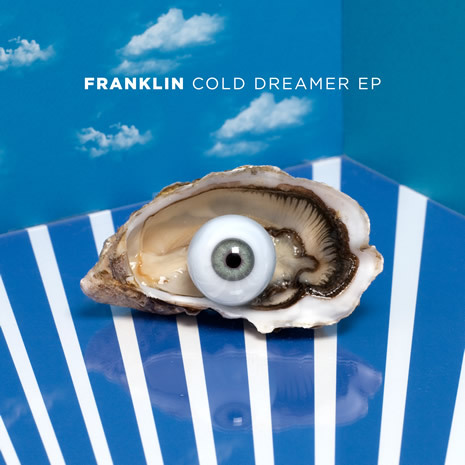 Cold Dreamer reflects how natural the collaboration between Frank’s and Lockhart’s production styles are universally intertwined. Their output is a musically euphoric, and an escape from the post punk electro pop of the 80’s. The songs on Cold Dreamer evoke tendrils of sound and dynamic textures, with dream pop vocals that make for an emotional journey into a very unique album. On every listen you start engaging more and more with different songs, while your ears start to translate a story that Franklin is communicating. The less is more aspect relates here, and the listener will interpret their own feelings towards each song, but the overall concept is extremely fun, but yet dark and appeasing. Even though this record may be a sub genre of alternative music as a whole, it definitely includes all the elements that the genre is known for. Empty, which is the last track on the album, sums up this beautifully orchestrated piece of musical literature, like concluding the final chapter of your favorite novel.